For other uses, see Troop (disambiguation). A troop is a military sub-subunit, originally a small formation of cavalry, subordinate to a squadron. In many armies a troop is the equivalent element to the infantry section or platoon. Exceptions are the Royal Horse Artillery and the US Cavalry, where a troop is a subunit comparable to an infantry company or artillery battery. A cavalry soldier of private rank is called a trooper in many Commonwealth armies (abbreviated "Tpr", not to be confused with "trouper"). 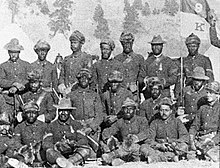 A related sense of the term "troops" refers to members of the military collectively, as in "the troops"; see Troop (disambiguation). In some countries, like Italy, the company-level cavalry unit is called "Squadron". Today, a troop is defined differently in different armed forces. The SASR is the only unit in the Royal Australian Infantry Corps to use the term troop to refer to its platoon size elements. SASR troops are also unusual as they are commanded by a captain—most troop/platoon sized elements are commanded by a lieutenant. In all cases, units which refer to platoon sized elements as troops refer to company-sized elements as squadrons and battalion-sized elements as regiments. Privates in the RAAC and SASR hold the rank "trooper", however this is not the case for any other Corps/units which use the term troops. 12th Royal Lancers on manoeuvres. In the British Army the definition of a troop varies by corps. Household Cavalry and Royal Armoured Corps: Three or four armoured fighting vehicles commanded by a subaltern, i.e. effectively the same level element as an infantry platoon. A unit of two to four guns or launchers, or an equivalent headquarters unit. Royal Artillery: A half-battery. In the Royal Horse Artillery, a troop used to be the equivalent to a battery in other artillery units. Royal Engineers, Royal Corps of Signals, Royal Logistic Corps, Special Air Service, and Honourable Artillery Company (and formerly the Royal Corps of Transport): A unit equivalent in size to a platoon in other corps, divided into sections or patrols. The Royal Engineers and Royal Corps of Signals used platoons instead until after World War II. Other army corps do not use the term. In the Royal Marines, a troop is the equivalent to an army platoon; a carryover from the organisation of the British Commandos in World War II. In the Canadian Army, a troop is the equivalent of a platoon within the armoured, artillery, engineer, and signals branches. Two to four troops comprise the main elements of a squadron. In the United States Army, in the cavalry branch, a troop is the equivalent unit to the infantry company, commanded by a captain and consisting of three or four platoons, and subordinate to a squadron (battalion). Companies were renamed troops in 1883. In the United States, state police forces are often regionally divided into troops. This usage came about from these organizations modelling themselves on the US Army, and especially the older cavalry units. For this same reason the state police and highway patrol personnel of most states are known as "trooper" rather than "officer". In Scouting, a troop is a unit made up of scouts or guides from the same locality under a leader. In the case of Guides, the term "company" is used more often, and was used by the founder in his first books about guiding. ^ Jobson, Christopher (2009). Looking Forward, Looking Back: Customs and Traditions of the Australian Army. Wavell Heights, Queensland: Big Sky Publishing. p. 93. ISBN 9780980325164. ^ Jobson 2009, p. 15. This page is based on the Wikipedia article Troop; it is used under the Creative Commons Attribution-ShareAlike 3.0 Unported License (CC-BY-SA). You may redistribute it, verbatim or modified, providing that you comply with the terms of the CC-BY-SA.